Would the faceless bureaucrats let you in? Think you know your country? 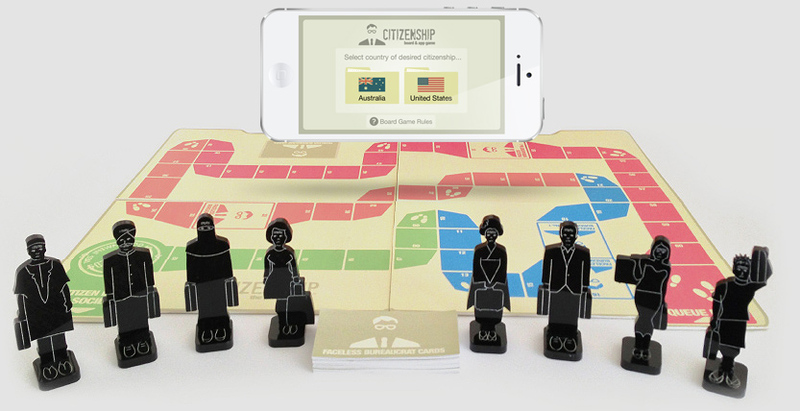 Play Citizenship board & app game (2+ players). Includes the game board, 4 immigrant playing pieces, and a deck of faceless bureaucrat cards. promoting awareness of protecting the rights of asylum seekers. Universal Declaration of Human Rights, Article 14: Everyone has the right to seek and to enjoy in other countries asylum from persecution. "The most unique and thought-prevoking game we've ever played. Whilst the game is fun to play with a group of friends, you're always mindful that beneath the satire, there's a serious issue that the game makers are addressing." "I'd recommend buying this if anything as a beautiful piece of design, and we've had a blast playing it too! The reality is most current citizens would have no chance in passing the government citizenship test." "Love the fact that this game will never get out of date by putting all the question cards in an iPhone app."